Quorn POW camp was based in the grounds of Quorn House and the entrance was on Wood Lane, where Northage Close is today. The site had been occupied earlier in the war by the American 82nd Airborne Division, 505th Parachute Infantry Regiment. 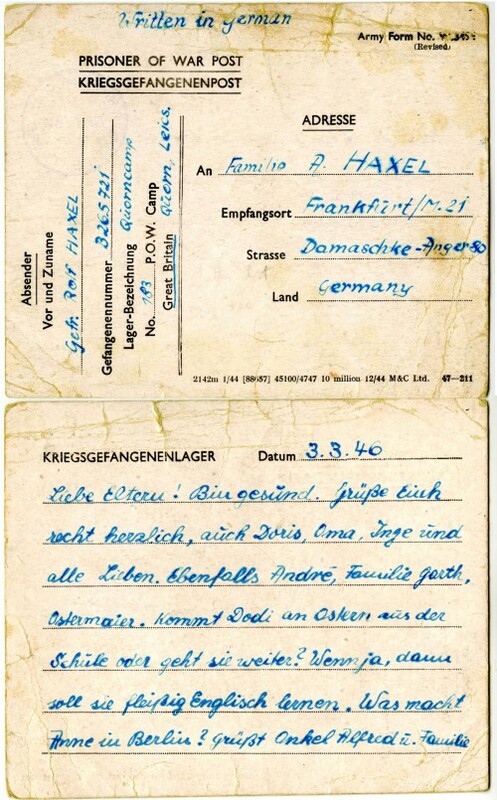 Below is a translation of a letter card sent from Quorn camp by German prisoner Rolf Haxel to his parents and family in Frankfurt. Thanks to Rachel McQuail (from Rawlins) and Steffi Marshall for translating this card for the museum. I'm Healthy. I am greeting you and Doris, Grandma, Inge and all loved ones cordially. As well Andre, Family Garth and Ostermaier. Will Dodi leave school at Easter or will she stay on? If so tell her to diligently learn English. What is Anne in Berlin up to? Say 'Hello' to Uncle Alfred and family.